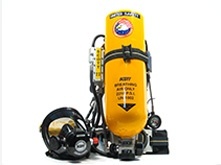 The SCBAs can be configured with 45 min and 1 hour units of stored air to complete a rescue, survey a confined space or safety sweep a contaminated area. We have thousands of these breathing equipment units in stock and we ship anywhere in the world. United Safety is at the forefront of innovation in supplying high pressure breathing air systems that dramatically lower set up and eliminate having to move air bottles inside a plant site. It comes complete with a 5 min egress cylinder. This is a very dependable piece of equipment and is used throughout the world in Immediately Dangerous to Life and Health (IDLH) conditions. It connects to our Breathing Air Storage Systems with our patented manifold devices to supply workers with a continuous air supply. 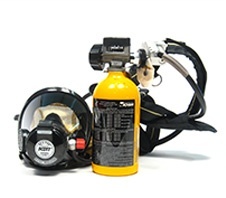 The Emergency Escape Breathing Apparatus (EEBA) comes in five ,10 and 15 minute models. As the name suggests, this piece of equipment is vital to survival and provides the user with enough breathing air to make a quick getaway to safer environs in the case of an emergency. We also offer an extensive range of other safety equipment. For more information please contact us.